Pictured above is a daily to-do list. Photo by H.Carnahan/Setonian. 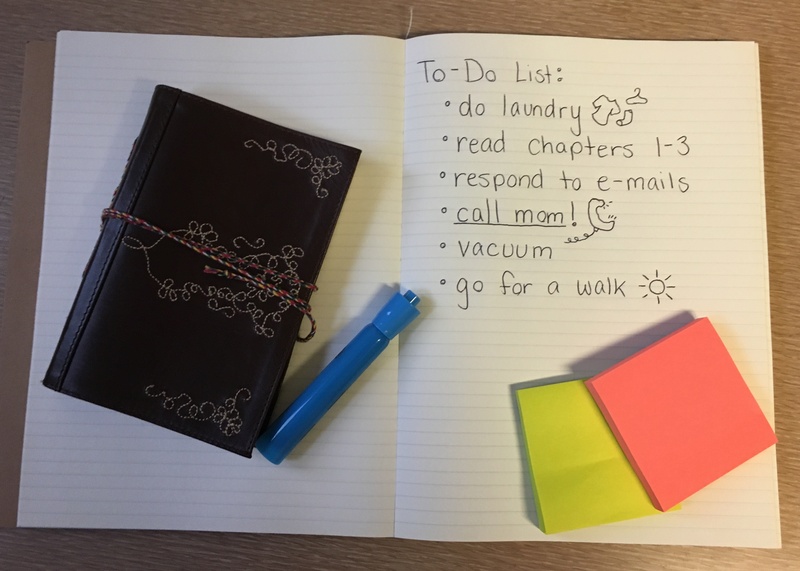 With the new semester just starting, many of us have new semester goals and resolutions. Like New Years Resolutions, semester goals can be hard to keep up with because life happens and things come up. Many of us struggle to reach our goals and resolutions we set for ourselves for the semester and year. Here are some tips to staying to your goals and resolutions. When you are making your goal or resolution, it shouldn’t be something general like “lose weight.” Make it specific, like “I want to lose 15 pounds by the end of the semester.” This will help you hit a very obvious, tangible goal. 2. Make it measurable and MEASURE IT. This goes along with making your goal specific. By making it specific and measurable, you will be able to better reach your goals. Measuring your goals and resolutions will help you see how far along you’ve come and how far along you still have to go. 3. Make smaller goals to help you hit your bigger goals. Make smaller monthly and weekly goals that will help you reach your overall goal or resolution. By being able to change or meet smaller goals every day, week or month, this can help guide you to your longer term or semester resolution and goals. Your goal shouldn’t be so outrageous that it is unattainable. Your resolutions and goals can be a stretch, but something you have a chance of reaching. Also, don’t give yourself so many goals that you can’t reach some or all of them. This could also cause you to feel like you failed. 5. Will this better you? Ask yourself: Will your goal or resolution better you? Will this help you become a better person? Will it strain your mental and/or physical health? While being physically and mentally strong is good, make sure your goals won’t cause you to have constant anxiety or cause you to become physically sick because you aren’t taking care of yourself.